Geo Plus Size Printed Tee is rated 4.8 out of 5 by 6. Rated 4 out of 5 by Rabbit45 from Love the color I only gave this top 4 stars because it shrank a bit in washing. Otherwise it is a great top. The colors are bright, the fabric soft and it is perfect to go with the purple skimmers. Rated 5 out of 5 by Kauai from Very pretty and comfy to wear This top runs large, I have it in 3x & will probably return for a 2x, I’m a 20/22. It is very pretty, not sparkly, great length, silky. Rated 5 out of 5 by marcia 2 from Great Top Really love the fabric and bold spring color of this great top! Purple is the new bright color this year! Rated 5 out of 5 by Juju2 from Very pretty Looks good with jeans or capris. Spring colors, nice material and fits well. Will wear this on an upcoming cruise. Rated 5 out of 5 by Jean the Vest Queen from Full of Spring colors! 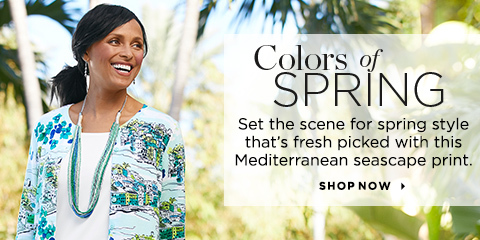 The Spring colors just drew me to this top. Extra bonue!! It is so light-weight and can be worn alone or with a cover. Perfect for Easter! Rated 5 out of 5 by Willie's Mom from Colorful spring shirt This shirt has great spring-like colors and the fabric feels nice.